What a fabulous time I had first thing on Monday morning when I went to Yester Primary School’s Dyslexia Awareness Assembly. This was part of the whole school’s drive to fulfil the ‘Dyslexia Friendly Schools Pledge’ as well as of the Support for Learning teacher, Lesley Cusack’s participation in a leadership course. The staff have done a great deal of professional development this year, both in terms of formal sessions run by Lesley and myself and the everyday, almost incidental discussions about the learning needs of individuals that go on every week of the year. Lesley had asked for volunteers from the p7?s and got offers of help from 10 children, only a couple of whom have dyslexia. 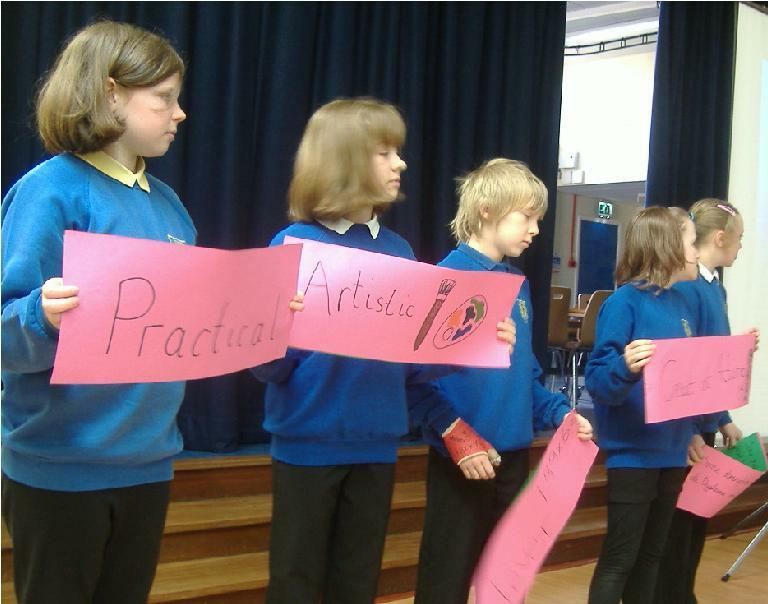 The children told the rest of the school what difficulties and strengths learners with dyslexia may have in a most professional and entertaining way. Then they talked about learning styles, stressing that we are all different and that diversity is to be celebrated. Finally they walked (or rather sang) the talk. They sang a song with actions and before asking the gathered crowd to follow suit, asked them to show whether they had preferred to listen, see or do the actions. It was interesting to see that there were a fair few who preferred to look or listen rather than act; although of course the majority identified themselves as kinaesthetic leaners. It was a thoroughly enjoyable session which very neatly illustrated something of what it means to have dyslexia. All credit to the children – and of course to Lesley for her indefatigable work. This entry was posted in Uncategorized and tagged Additional Support Needs, Dyslexia, Dyslexia Friendly Schools, learning styles, Support for learners, Yester Primary School by Hilery Williams. Bookmark the permalink.